Peaks and Valleys is a system neutral OSR adventure from Grinning Gargoyle Games. It is centered on wilderness exploration, as the players search a remote mountain valley looking for clues pointing the way to an ancient treasure. Along the way they may hunt for long lost pieces of history, make a powerful friend of a reclusive king, or send him toppling off his throne. 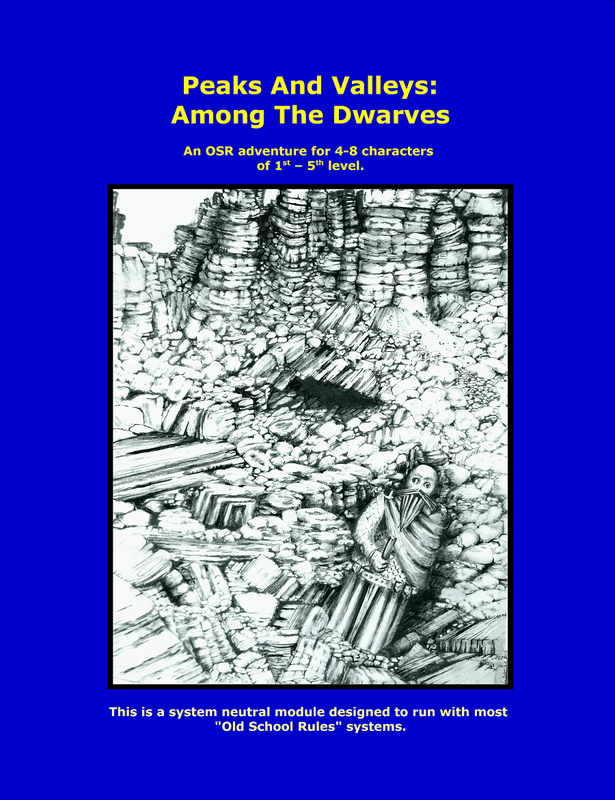 This adventure is suitable for 4-6 players of 1rst - 2nd level, and should take the party to levels 5 -6. In addition to the adventure there is a wealth of optional setting information, making it easy to play Peaks and Valleys as either a one off adventure, or as the centerpiece to a whole campaign. A full length adventure that will take a party from 1st to 5th level. 5 fully developed cities and villages, with random areas, extra plothooks, sidequests, and NPCs. 29 wilderness areas, including over a dozen dungeons. A completely optional overarching plot: use this module as an isolated piece of sandbox wilderness, or as a whole adventure. Pretty nifty, so give it a look and if you like it, go back and donate something.